Thank you for your interest in Monomer Polymer & Dajac Products. Monomer Polymer & Dajac Labs offers a full range of high quality products and services with over 2,000 catalog products and custom solution offerings that address complex requirements. Monomer Polymer catalog products are manufactured based on proven scientific principles that have been developed internally over the years for customers who require material of the highest quality and purity. In addition, Monomer Polymer has extensive production capabilities, including custom synthesis solutions ranging from kilo to multi-ton volumes. The company applies key expertise in taking specialty chemicals from start-up concepts to commercialization. 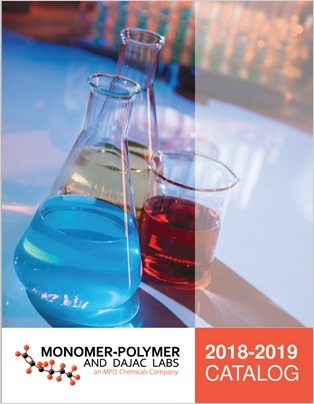 Please fill out the form below to download the Monomer Polymer Product Catalog.